In 1947, the crown jewel of the British Empire, India, was partitioned between the predominantly Hindu and Muslim sections of the country, creating the separate states of India and Pakistan (along with East Pakistan, which would soon become the independent country of Bangladesh). The separation was not a pleasant one and before a year had passed, India and Pakistan were at war. There would be two more wars between the two countries over the next thirty years, with the most recent conflict ending in 1971. In the interim, there have been numerous smaller clashes between the two countries, with most centering over the ownership of the province of Kashmir. Both countries have sought to exploit the river for their various industrial bases, which consist predominantly of water-heavy textile industries. This has inevitably lead to tension. However, in 1960 the two countries signed the Indus Waters Agreement, a landmark treaty governing the allocation of water from the Indus River. The treaty has survived the outbreak of three wars between India and Pakistan and in fact, has been one of the few bright spots in a relationship that seems to be constantly marred by setbacks in normalizing relations year after year. However, climate change looks to potentially change all of this. Anyone who claimed that the Indus River was going to decrease in flow would probably be directed to observe the massive flooding that occurred in Pakistan last year. This event is actually part of the larger issue, namely, the melting of the Himlalayan glaciers which supply the Indus River. While in the short-term, the melting of the glaciers will in fact lead to increased riverflow, over the long-term, flow rates will inevitably decrease as fewer and fewer of the glaciers remain to supply the river through glacial melt. While the wider conflict between India and Pakistan over Kashmir has escalated to a full-scale war three times and a smaller-scale war (minor war) once, the issue of water rights and allocation has never been the primary point of contention. 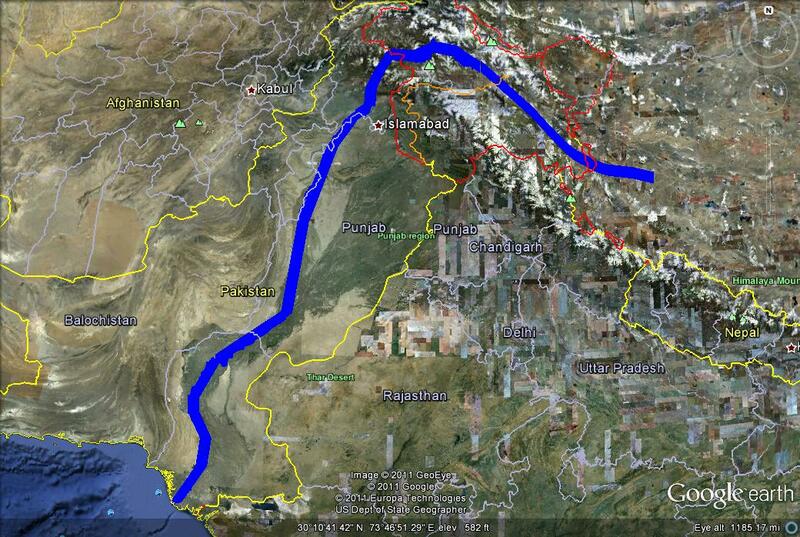 Indeed, the Indus Waters Treaty has survived all four conflicts between the two countries without modification. At present, conflicts between the two countries over the Indus Waters Treaty have not gone beyond diplomatic bickering. As the effects of climate change become more pronounced, there will be two distinct effects on the region. The first of these will be an increase in the frequency and power of monsoon storms, brought on by rising sea temperatures. 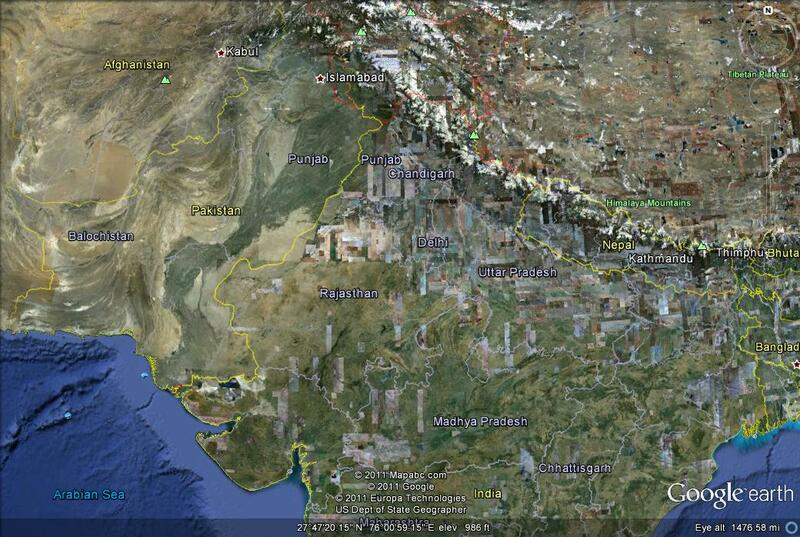 The second effect will be an increase in the melting of the Himalayan glacier. 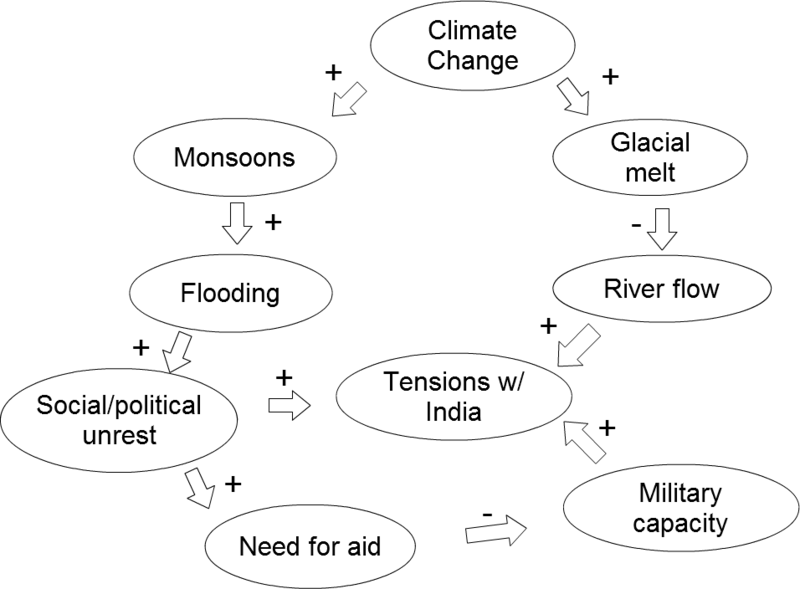 Both of these effects will increase as climate change’s effects increase in scope and severity, therefore they are depicted in the diagram as positive feedback. An increase in the strength of monsoons in the region will likely lead to an increase in flooding, while, conversely, an increase in Himalyan glacial melt will lead to a decline in the flow of the Indus River, the headwaters of which originate from the Himalays. Thus these stages in the diagram are depicted as positive and negative feedbacks, respectively. A decrease in the flow of the Indus River will mean that less water makes it to Pakistan, as the river follows a winding course through India before reaching Pakistan. This will potentially lead to an increase in tensions with India, as Pakistan may believe that the decrease in river flow is a result of India manipulating the flow of the river rather than a byproduct of climate change. In addition, increased flooding will lead to the potential for increased social and political unrest, similar to that which erupted in Pakistan following the flooding of the Indus River last summer. The additional internal turmoil will demand more resources from Pakistan’s government, which will likely be unable to provide it. It will therefore need to turn to foreign powers for aid. The greater the unrest, the greater the need for aid is likely to be. This focus on social issues also has the potential to negatively affect Pakistan’s military capacity, as the military is likely to be depended on greatly to provide services to the population as well as maintain order. A weakened or pre-occupied Pakistani military will potentially embolden India to take a harder line against Pakistan or to act more freely within traditional Pakistani spheres of influence. It will certainly concern the Pakistani military elite, who will be concerned that India will take military advantage of the situation, perhaps to lay claim to the entirety of the disputed Kashmir region. Regardless of how grounded these fears might be, what is certain is that they will increase political and military tensions with Pakistan’s eastern neighbor, making the likelihood of conflict that much higher. Given the state of relations between India and Pakistan, any situation where a potential flashpoint could develop, however unlikely, is worth paying attention to. The status of both countries as nuclear powers adds weight to the issue, since a disagreement over allocation of water resources could, if circumstances are dire enough, spark a wider conflict which, if past conflicts are any indication, would not take long to spiral out of control. "The Indus Equation". Strategic Foresight Group, 2011.